Russia senior guard Jenna Cordonnier drives as Lehman Catholic’s Hope Anthony defends during a Division IV sectional quarterfinal on Wednesday in Sidney. Lehman Catholic's Anna Cianciolo shoots as Russia's Jenna Cordonnier defends at Sidney Wednesday. Lehman's Grace Monnin drives as Russia's Jessica York defends at Sidney Wednesday. Russia's Jessica York shoots as Lehman Catholic's Carly Edwards and Lauren McFarland at Sidney Wednesday. 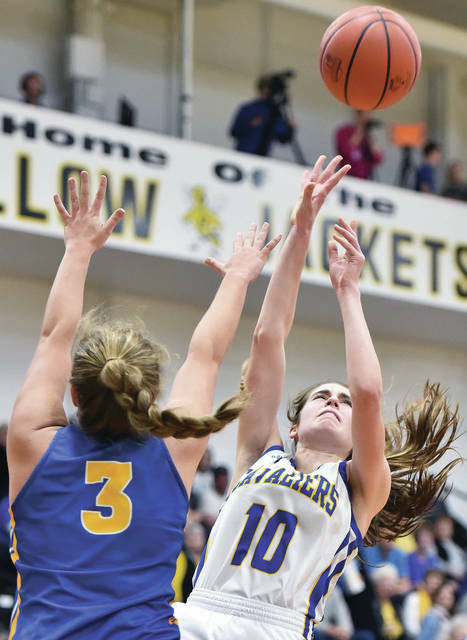 Houston’s Hollie Voisard shoots as Legacy Christian’s Kathleen Ahner defends during a Division IV sectional quarterfinal on Wednesday in Sidney. Houston’s Hayden Riesenbeck and Jess Monnier pressure Legacy Christian’s Margaret Kensinger during a Division IV sectional quarterfinal on Wednesday in Sidney. Houston's Hayden Riesenbeck works to break free from Legacy Christian's Rachel Gay and Kathleen Ahner during a Division IV sectional quarterfinal on Wednesday in Sidney. Houston's Jess Monnier shoots as Legacy Christian's Emma Hess defends during a Division IV sectional quarterfinal on Wednesday in Sidney. Russia's Jenna Cordonnier and Lehman Catholic's Emma Kennedy fight for the ball during a Division IV sectional quarterfinal on Wednesday in Sidney. Russia’s Laurissa Poling looks to get past the defense of Lehman Catholic’s Lauren McFarland during a Division IV sectional quarterfinal on Wednesday in Sidney. Poling led Russia with 17 points. 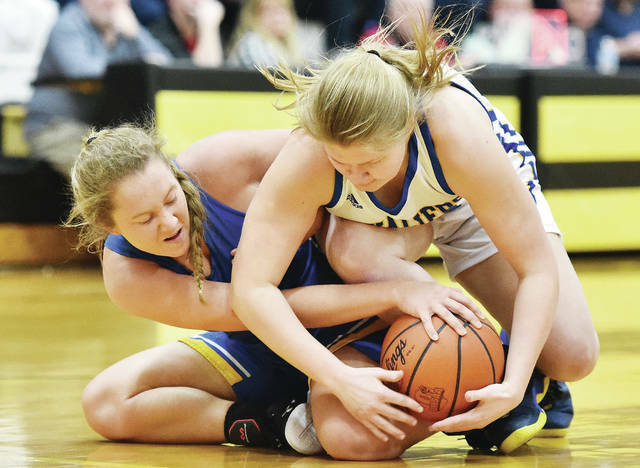 SIDNEY — Russia has started slow in a lot of games this season, but it looked more than slow early in a Division IV sectional quarterfinal against Lehman Catholic on Wednesday. The Raiders were downright lethargic, while Lehman looked like every one of its players on the court had downed a few Red Bulls in the locker room. 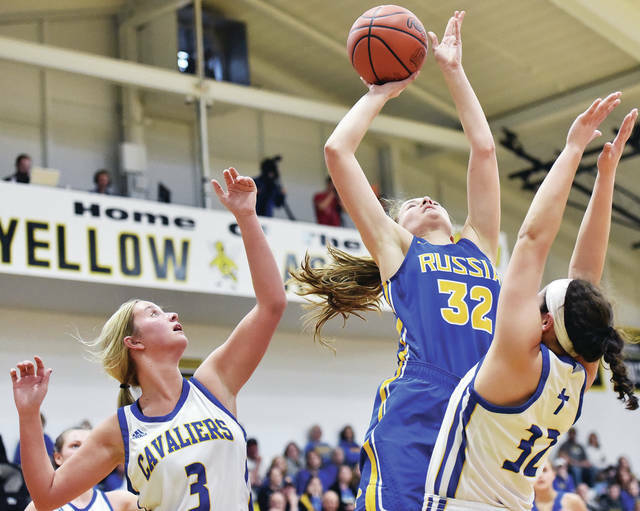 The Cavaliers caused a bunch of turnover and often sped by Russia defenders to the glass. There were nerves in the locker room at halftime according to Russia forward Laurissa Poling. If the nerves made any of the Raiders jittery, the energy was put to good use on the defensive end in the second half. Russia largely shut down the No. 6 seed Cavaliers in the second half and rallied to earn a 47-38 victory at Sidney High School. The No. 3 Raiders (14-9) advance to play Botkins in a sectional semifinal on Saturday at Sidney. Lehman finishes 11-11 overall. Lehman led 18-16 at halftime but was outscored 22-11 until the 2:28 mark in the fourth quarter. Russia coach Andy Timmerman said the team’s improved man-to-man defense was key to the turnaround. Poling was one of the seniors leading the improved performance. After playing through foul trouble in the first half, she scored 11 of her game-high 17 points in the second half and gobbled up rebounds on the defensive end. “We just decided to put our nerves aside at halftime and play like we knew we could play,” Poling said. 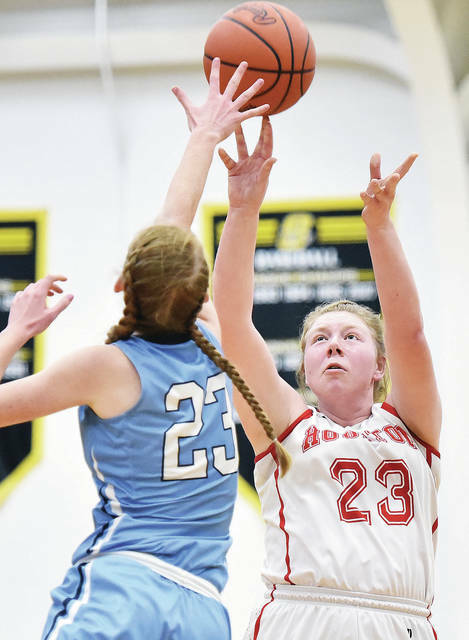 Russia senior guard Jenna Cordonnier added eight of her 10 points in the fourth quarter to help the team run away, with six coming from the free-throw line. 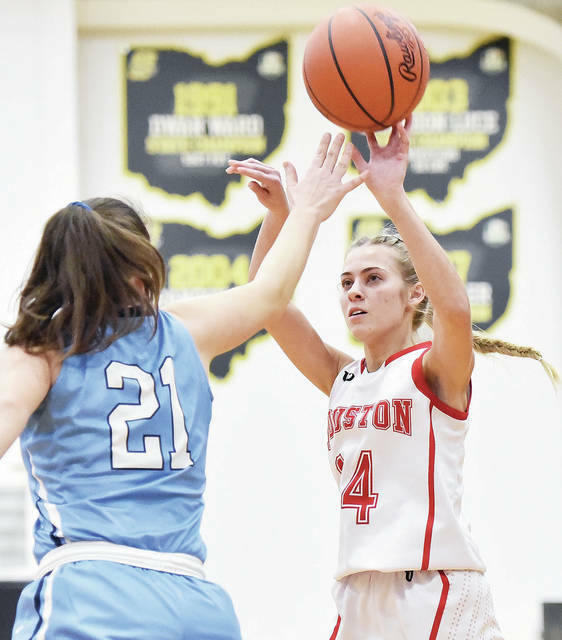 Poling, who is 6-foot-1 and will be preferred walk-on at Wright State for volleyball next fall, struggled to get open early on the offensive end against Lehman 6-0 senior forward Carly Edwards and picked up early fouls on the defensive end, which forced her to sit on the bench much of the second quarter. Poling did, all while committing one foul in the second half. “Our biggest concern was what they took advantage of, their post play,” Lehman coach Craig Hall said. “She has some nice moves inside and did a nice job finishing. That’s where we’ve struggled all year. After Lauren McFarland hit a 3-pointer to open the third quarter and give Lehman a 21-16 lead, the Cavaliers didn’t score a field goal for the next five minutes. Laurissa Poling hit 1-of-2 free throws, Jessica York made a basket and Poling made a basket with 3:29 left to give Russia a 22-21 lead. Hall called a timeout after Poling’s basket but Ashley Scott made a basket with 3:07 left to push the Raiders’ lead to three points and cap off a 7-0 run. Grace Monnin later hit a jumper to tie it 24-24 but Kendal Monnin hit a 3 from the right wing on Russia’s next possession to put the Raiders ahead with two minutes left. Poling made a basket to extend the lead to 29-25 with 7:29 left in the fourth. McFarland hit a 3 with 4:55 left to cut the gap to within one point but Russia then finished it off with a 11-1 run. York scored 30 seconds after McFarland’s basket and Poling made a basket off the glass to put Russia ahead 33-28 with 3:39 left. After Hope Anthony split a pair of free throws for Lehman, Poling made a basket and split a pair of free throws and Jenna Cordonnier made two pairs of foul shots to put the Raiders ahead 40-29 with two minutes left. The teams traded points early but Lehman grabbed the lead before halftime. York hit a basket to give Russia an 8-6 lead with 1:30 left in the first quarter but Anna Cianciolo made a pair of free throws and Rylie McIver scored after a steal with 59 seconds left to put the Cavaliers ahead 11-8. York hit a basket to tie it 12-12 with 6:17 left in the second but Grace Monnin made a 3-pointer with 5:56 left to increase the lead to three points. After a basket by Shea Borchers cut it back to one, McFarland made a basket a minute later to extend it back to three points. Lehman pushed its lead to 18-14 late but York made a basket with 13 seconds left to cut the gap to two points at halftime. 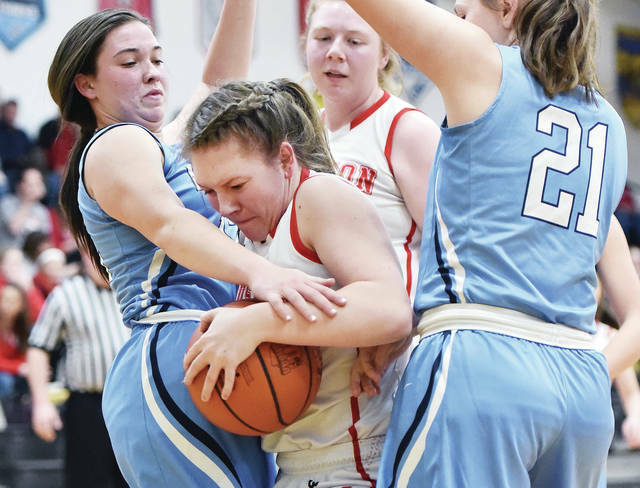 “We were in foul trouble there a little bit (in the first half), which actually I think if we’d have been more aggressive on defense, we wouldn’t have had,” Timmerman said. “If we’d have been aggressive, we’d have been in the right spot. Instead, we were in a bad spot and were fouling while trying to make up for it. York finished with 10 points. Lehman will lose five seniors to graduation: Grace Monnin, Edwards, Allison Bornhorst, Emily Fogt and Grace Olding. Bornhorst missed all season due to an ACL injury sustained playing soccer last fall. “It’s a good group of kids. I hate to see them graduate,” Hall said. “That’s the most experienced group we’ve had. It hurt us not having Allison Bornhorst because she was always kind of a team leader and spiritual leader and kept us fired up and pumped up. Monnin and Edwards have been varsity contributors all four years. McFarland, a junior forward, led Lehman with 10 points while Grace Monnin finished with nine and Edwards finished with seven. Like Wednesday’s game, both of Russia’s regular-season games against No. 7 Botkins (10-12) in SCAL play were close early until the Raiders pulled away late. The Raiders won 46-36 on Dec. 15 and 45-36 on Jan. 24. “We’ve just got to come out and play and try to set the tone,” Timmerman said. 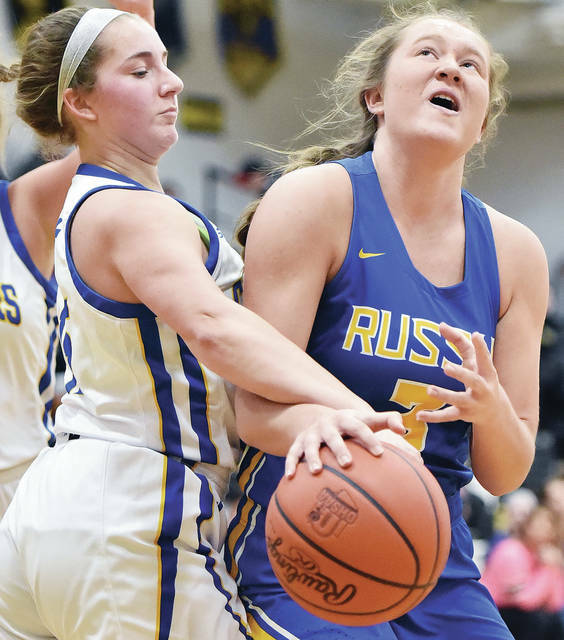 Russia has won a sectional the last two years, and Poling said the team is hopeful it can take the next step toward a third on Saturday. Houston took the lead in the third quarter against No. 2 seed Legacy Christian but couldn’t hold on. 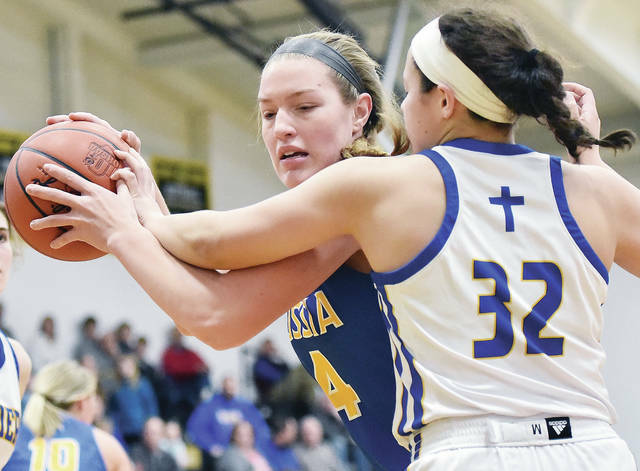 The Knights scored the first six points of the fourth quarter to take control and then pulled away from there to a win in Wednesday’s second Div. IV sectional semifinal at Sidney. Legacy (21-2) advances to face No. 8 Riverside (12-10) on Saturday in Sidney. The Wildcats, which were the sectional’s No. 5 seed, used an 18-15 scoring advantage in the third quarter to take a 34-33 lead. After the Knights started the quarter with their big run, Jess Monnier hit a 3 to bring Houston within 39-37 with two minutes left. Legacy then finished the game with a 10-2 run. 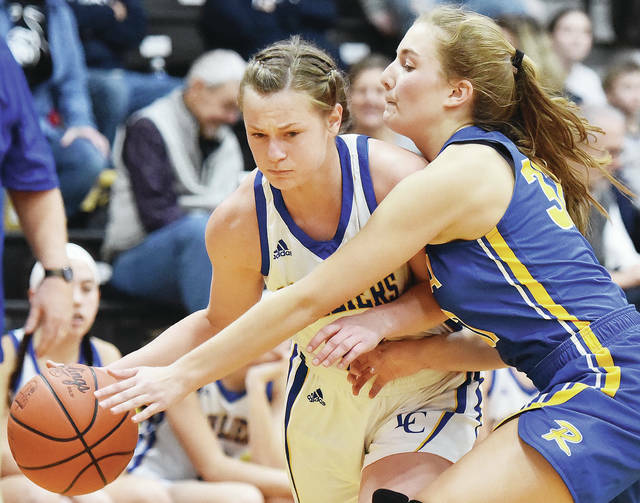 Sophomore guard Kathleen Ahner scored 10 of her 12 points in the fourth quarter to help the Knights win, including five from the free-throw line. Emma Hess, a 5-10 sophomore forward, led the squad with 18. “They got the ball to Hess, and they just made great plays,” Houston coach Brad Allen said. “When you have a player like that that can basically do whatever inside or outside, it’s a challenge. We knew it would be a challenge to try and contain her. 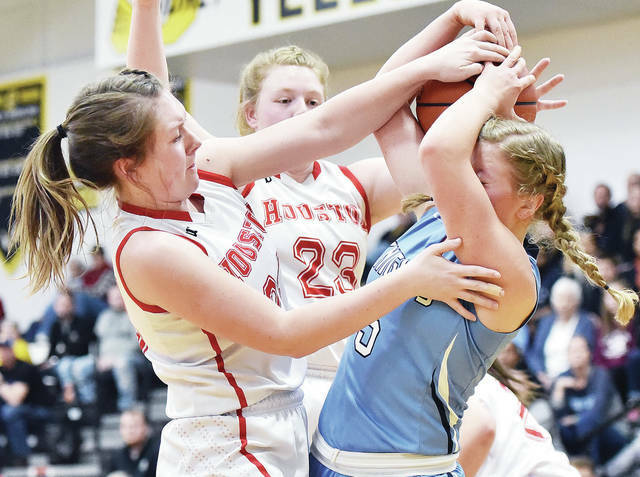 Senior guard Hollie Voisard led Houston with 13 points while sophomore wing Amber Stangel scored 11. Monnier finished with nine. “It was a total team effort,” Allen said. “They all tried to do what they could to get that W. We put (Legacy) against the ropes there. We were competitive. It was a good fight tonight. Vosiard and Monnier, a 6-0 forward, are two of the team’s four seniors. The Wildcats (9-14) will also lose senior guard Addie White and senior wing/post Hayden Riesenbeck to graduation. Lehman Catholic’s Anna Cianciolo shoots as Russia’s Jenna Cordonnier defends at Sidney Wednesday. Lehman’s Grace Monnin drives as Russia’s Jessica York defends at Sidney Wednesday. Russia’s Jessica York shoots as Lehman Catholic’s Carly Edwards and Lauren McFarland at Sidney Wednesday. Houston’s Hayden Riesenbeck works to break free from Legacy Christian’s Rachel Gay and Kathleen Ahner during a Division IV sectional quarterfinal on Wednesday in Sidney. Houston’s Jess Monnier shoots as Legacy Christian’s Emma Hess defends during a Division IV sectional quarterfinal on Wednesday in Sidney. Russia’s Jenna Cordonnier and Lehman Catholic’s Emma Kennedy fight for the ball during a Division IV sectional quarterfinal on Wednesday in Sidney. This entry was tagged Andy Timmerman, basketball, Brad Allen, Carly Edwards, Cavaliers, Craig Hall, girls basketball, Hayden Riesenbeck, high school, Houston, image, images, Jenna Cordonnier, Jess Monnier, Laurissa Poling, Legacy Christian, Lehman Catholic, photographs, photos, picture, pictures, playoff, Playoffs, Postseason, Raiders, result, Russia, Rylie McIver, score, sectional, Sectionals, Sidney, statistics, stats, Tournament, tourney, who won, Wildcats, Xenia, Xenia Christian, Xenia Legacy Christian. Bookmark the permalink.